Using a very sturdy knife, cut a cap off the top of the pumpkin. This isn't an easy job - I went around the top of the pumpkin with my knife at a 45-degree angle to get a nice size cap. Clear away any seeds and strings from the cap and hold it aside while you scoop out the seeds and filaments inside the pumpkin. (Hold onto this goop -- you can separate the seeds from the filaments and roast them.) Season the inside of the pumpkin with salt and pepper and put it on the sheet or in the casserole. Now you have a choice, you can either toss the bread, cheese and garlic together in a bowl, then pack it into the pumpkin, or you can alternate layers of bread and cheese and scatter the garlic here and there. (I mixed everything together.) Either way, the filling should go into the pumpkin and fill it well. You might have a little too much filling or you might need to add to it -- it's hard to give exact amounts. Season the cream with salt, pepper and several gratings of fresh nutmeg and pour the cream into the pumpkin. Again, you might have too much or too little. You don't want the ingredients to swim in cream, but you do want to get a feeling that they're moistened. Put the cap back in place and bake the pumpkin for about 2 hours -- check after 90 minutes -- or until everything inside the pumpkin is bubbly and the flesh of the pumpkin is tender enough to be pierced easily with the tip of a knife. I removed the cap during the last 20 minutes or so of baking so that the top could brown. As you can see, I cut the pumpkin into wedges, so we could cut a cube of pumpkin and have it with some of the stuffing, but you can also leave the pumpkin whole and use a big spoon to scoop out pumpkin and filling. 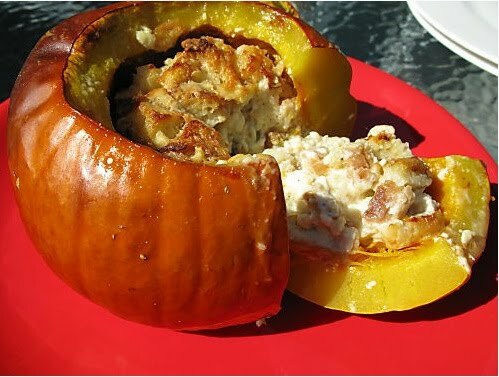 You could even scrape the pumpkin into the filling and mix it all up. Caution: If you want to spoon out the pumpkin and the filling or try mixing it, you better bake the pumpkin in a casserole because you'll need to support the sides. * You can also use this recipe to fill smaller pumpkins for individual servings. They will cook in about an hour and a quarter. Very cute presentation.